Many of us only become active in charities when they directly affect our lives. Our kids have autism, we wear the blue puzzle pin. Our grandmother has breast cancer, and our world becomes pink. Some charities, however, go beyond and reach out to those without personal motives. The red ribbon of the AIDS movement, and Lance Armstrong‘s Livestrong bracelets are examples of awareness becoming almost fashionable. Team Diabetes has been that for me. I first joined in 2003 because I was interested in running a marathon in Iceland. 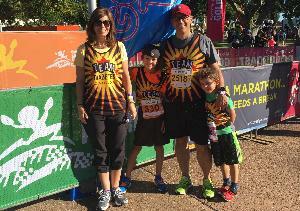 7 events and 3 continents later, and I'm still running for Team Diabetes, more committed than ever. Team Diabetes is about keeping myself healthy, raising funds to support my neighbours to make them healthier, and encouraging people to take control of their own health and stay active. I need a race on my calendar to keep my head in the game, Team Diabetes does that for me. And, through my involvement in Team D, I have met some truly wonderful people affected by diabetes and have become more committed to the cause than ever. I want kids with diabetes to feel safe in school, I want people with Type 2 not to feel stigmatized, I want a cure to be found. So I run, so I fundraise, so I spread the word. My goal for this event is to raise $13 000. Thanks for supporting me on the journey.